The PicoScope 6000 Series is the ultimate USB oscilloscope. High-end features such as serial decoding, mask limit testing and segmented memory are included as standard. The PicoScope 6000 Series gives you the deepest buffer memory available as standard on any oscilloscope at any price. The SuperSpeed USB 3.0 interface and hardware acceleration ensures that the display is smooth and responsive even with long captures. Other oscilloscopes have high maximum sampling rates, but without deep memory they cannot sustain these rates on long timebases. The 2-gigasample buffer on the PicoScope 6404D can hold two 200 ms captures at the maximum sampling rate of 5 GS/s. To help manage all this data, PicoScope can zoom up to 100 million times using a choice of two zoom methods. There are zoom buttons as well as an overview window that lets you zoom and reposition the display by simply dragging with the mouse. Some oscilloscopes struggle when you enable deep memory; the screen update rate slows and controls become unresponsive. The PicoScope 6000 Series avoids this limitation with use of a dedicated hardware acceleration engine inside the oscilloscope. Its massively parallel design effectively creates the waveform image to be displayed on the PC screen and allows the continuous capture and display to the screen of 2.5 billion samples every second. PicoScope oscilloscopes manage deep memory better than competing oscilloscopes, both PC-based and benchtop. The PicoScope 6000 Series is fitted with fourth-generation hardware acceleration (HAL4). This speeds up areas of oscilloscope operation such as allowing waveform update rates in excess of 170 000 waveforms per second and the segmented memory/rapid trigger modes. The hardware acceleration engine ensures that any concerns about the USB connection or PC processor performance being a bottleneck are eliminated. Oscilloscopes with high waveform capture rates provide better visual insight into signal behavior and dramatically increase the probability that the oscilloscope will quickly capture transient anomalies such as jitter, runt pulses and glitches â that you may not even know exist. 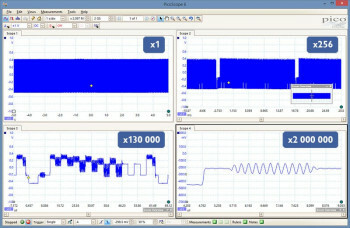 PicoScope deep memory oscilloscopes use hardware acceleration to achieve over 170 000 waveforms per second. Ever spotted a glitch on a waveform, but by the time youâve stopped the scope it has gone? With PicoScope you no longer need to worry about missing glitches or other transient events. 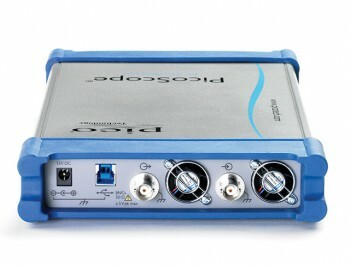 PicoScope can store the last ten thousand oscilloscope or spectrum waveforms in its circular waveform buffer. We are proud of the dynamic performance of our products and, unlike most oscilloscope manufacturers, publish our specifications in detail. The result is simple: when you probe a circuit, you can trust in the waveform you see on the screen. The USB connection not only allows high-speed data acquisition and transfer, but also makes printing, copying, saving, and emailing your data from the field quick and easy. PicoScope 6000 Series oscilloscopes feature a SuperSpeed USB 3.0 connection, making the already-optimized process of data transfer and waveform update rates even faster. Further benefits of a USB 3.0 connection include faster saving of waveforms and faster gap-free continuous streaming of over 150 MS/s when using the SDK, while the scope is still backward-compatible with older USB systems.